This fish is coated with an epic insanely good sweet and spicy sauce. 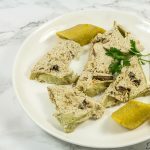 Peppered fish is a must make! This is a hit at African parties. I don’t think I’ve been as excited about any recipe as I am with this one. I have been meaning to share this peppered fish on the blog for a while now. But what my friend said some days ago made me hasten up and post it. Being a Cameroonian geh like me, she had never had peppered fish, a Nigerian fish dish, which is mostly served at parties. So she tried it for the first time at an occasion in her church and she was in love. Like in mad love! She told me she ate it so much at the occasion that she became ashamed. Ha. 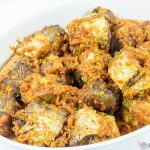 Now the best part is someone at the occasion introduced her to a kind of fish which is was used to make the peppered fish that stole my friend’s heart. It is called, “Pacific Whiting”. After trying Pacific Whiting, in her home my friend totally loved it. And she brought a whole box for me to try too. Yes to friends who share awesome food-related discoveries! So the fish used here is Pacific Whiting also known as Hake. You can look for it just about anywhere fish is sold. However, if you can’t find it any white fish will do. Preferably, the fish should be slim so the insanely good spicy tomato sauce penetrates every nook and cranny of the fish. This is my take on the Nigerian peppered fish. The fish is sweet and spicy, drenched in an epic sauce. I love having this with some fried ripe plantains or french fries on the side. This is a great appetizer you can serve guests, serve at parties or just make to enjoy at home. Step 1: Cut fish into about 3-4 slices per fish and rinse thoroughly. Season with salt, garlic powder, ginger powder and onion powder. Step 2: Deep fry the fish until done. Step 3: Make a sauce with red bell pepper, tomatoes, onions, garlic, ginger and white pepper. Then mix the fish in that epic sauce and let it sizzle. That’s all. Enjoy as it is or with any side you like or as it is! I have served it here with an easy coconut rice (recipe coming tomorrow!). But I also like it with fried potatoes, fried plantains or really just the way it is! I am sharing this recipe on the first day of November which also means only 2 months to the end of 2017. Here’s wishing you a happy new month and an amazing end of year. Rock on, lovelies! This fish is coated with an epic insanely good sweet and spicy sauce. Peppered fish is a must make! 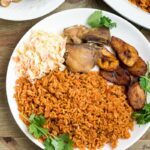 This is a hit at African parties but no need to wait for a party before making this. You should totally make this and enjoy at home. Cut fish into 3-4 slices each. Wash thoroughly and pat dry with a paper towel. Season fish with half a teaspoon of salt, garlic powder, ginger powder and onion powder. Mix well to coat and set aside. Heat oil in a large pot or wok. Deep fry the fish until golden brown on each side. Be sure to flip when one side gets brown so the fish is evenly cooked. Cook fish in oil for about 8 minutes (about 4 minutes on each side) then remove and place on paper towel to absorb excess oil. In a blender, put in tomatoes, onions, bell pepper, garlic, ginger and green onions. Blend into a puree. Pour one cup of oil into another pot. Let it heat up on high for about 5 minutes then pour in puree. Let it cook for about 10 minutes until the pepper/tomato sauce shrinks and starts sticking to the bottom of the pot. Add in half a teaspoon of salt, Maggi and ground white pepper. Stir well. Add in fried fish and stir to ensure the sauce properly coats the fish. Let it simmer together for about 3 minutes then turn off the heat. 1. To make your tomato sauce less spicy (hot), use only 1 habanero (hot pepper). 2. If you do not like fish cooked with bones in, substitute the whole fish used in this recipe with fish fillets. 3. To make the fish extra tasty, season the fish and keep overnight in the refrigerator to marinade before frying. I was not thinking about making fish next week, but now you have made me plan my next week’s meal plan around this recipe. I am definitely going to make this! Yum! It is so good, Lois! One of my favorite ways to eat fish. Enjoy! 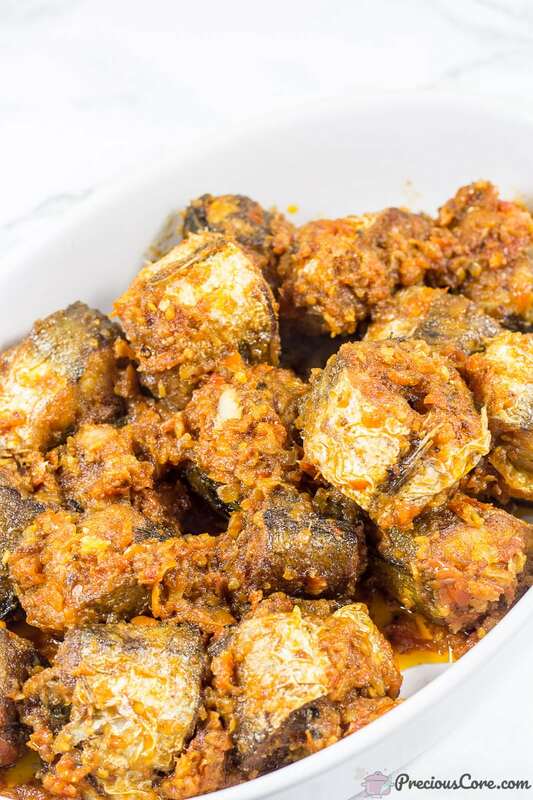 Pls which stores here in US can I get this fish? Hi dear, you could get it from Restaurant Depot. Here in Minnesota, it is also sold at Cub Foods. Thanks will do restaurant depot. It is so good, Vero. Please let me know if you try it. 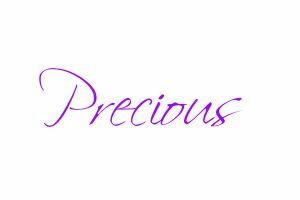 Precious you are the best. Keep the good work, You have make me a super mum for my children. May God continue to bless you. This is making me dance for joy, dear. Glad you enjoyed the recipe! Oooh this makes me so happy, Sylvie. Thanks so much for coming back to let me know. Glad you loved it! Sweet and spicy is always a great combo. I can see myself giving this recipe a try! It is so good, Jamila. Enjoy! 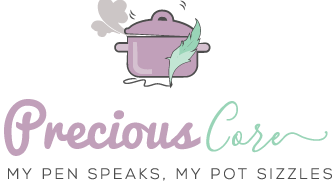 I actually did not know how to cook until I found this site, when i have no clue of what to cook I come here and bam!!! I find the perfect and easy recipes ,thanks a million precious you’re literally a life saver😍. Oh, I’m so glad to hear this, Nancy. Thanks for taking out time to let me know. I hope the recipes continue to inspire you. Hope it went well, Sherry! So sorry I couldn’t respond earlier. Awww you are most welcome, dear! Im definitely trying this one out. Hi hi hi. So much love for you and your sizzling pots…can’t get enough. Thanks for making my day, dear! Really enjoying the recipes. Questions on the oils used. What kind of oil – step 3 and step 5. 3.Heat oil in a large pot or wok. Deep fry the fish until golden brown on each side. 5.Pour one cup of oil into another pot. Let it heat up on high for about 5 minutes then pour in puree. You can really use any kind of oil. 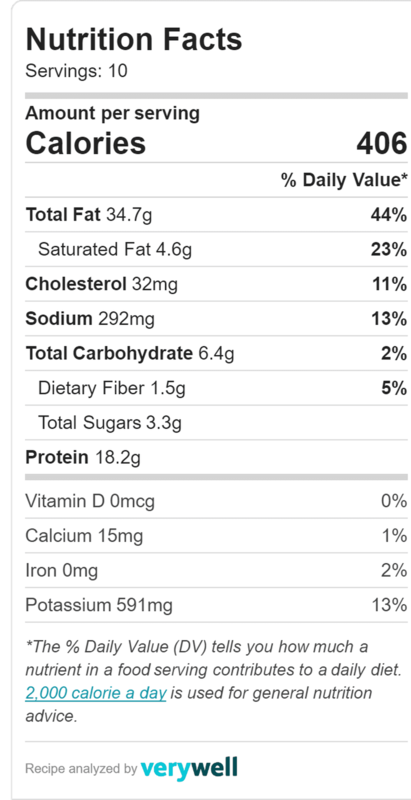 Vegetable oil, canola oil and corn oil are great options. Hope you enjoy the recipe! Hi Ann, Maggi is the brand name of a particular kind of stock cubes. Any 4g stock cubes will work in this recipe. You could also substitute 1 stock cube with 1 teaspoon of bouillon powder. Hope this helps. My coworker just recently got married and her husband has been asking for fried fish. Although I can make my own, I make a lot of unconventional substitutions (as taught by my mother). Bonus: hake is one of the few fish that is plentiful and affordable in South Africa. It is so good, Marvelous! Hope you are able to try it.